I find cooking over a fire to be a bit…inconsistent, especially as far as timing goes. So here are instructions for really easy, super flavorful Italian beef sandwiches with a little bit of a peppery kick. 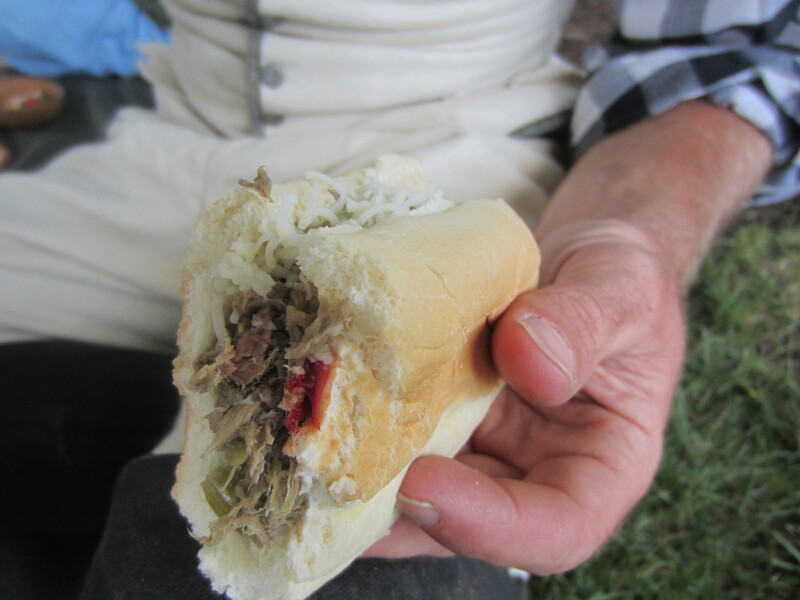 Italian Beef Sandwiches…easily made over a campfire. 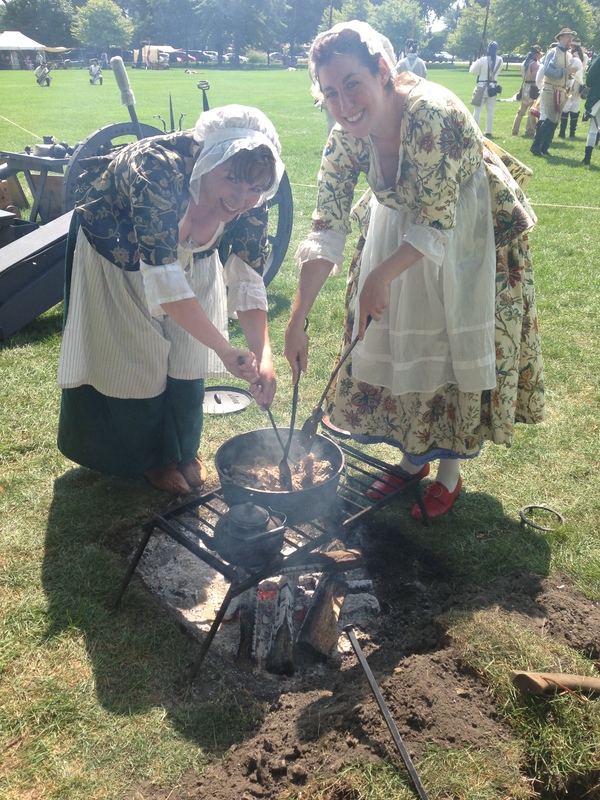 Put beef roast in a large dutch oven. Pour in the jar of pepperocini and one jar of giardiniera. Cover and put dutch oven over hot coals. Cook for 2 hours. Add the other jar of giardiniera. Cook for another 2 hours. Check to make sure liquid hasn’t evaporated. If it has, add some water or beef stock. If beef falls apart easily at this point, tear it up into small pieces. Continue cooking until beef is very tender and cooked through, for another hour or so, or until it’s time to eat. Serve on rolls with the mozzarella. Jenny Craig: High in protein, but everything else is nice and low. Count it as 1 entrée and 1 milk serving. Or, if you’re low on protein anyway, just count it as an entrée. I’m sorry that the cooking instructions aren’t more specific. Unfortunately, when cooking over a fire, timing really varies. I can tell you that if this were a slow cooker recipe (which can definitely be done), you would want to cook the beef 6 hours on low, or 3 hours on high. Really, you just pour the pepperocini, giardiniera, and beef roast into the pot and cook it for a while, making sure the liquid doesn’t completely evaporate. But I didn’t just want to say that. Have to sound all fancy-like. I will say that this was probably the best Italian beef I’ve ever had. Usually I just use a pre-made spice packet. The peppers add way more flavor, and, since they’re just vegetables, way more volume and nutritional value. In other words, you can eat a bigger sandwich and that’s okay. I can’t tell you exactly the amount of sandwiches this makes. I know it must have made at least eighteen for us, or more. We had a lot of leftovers too. So I calculated all the above information assuming 3 ounces of meat and a little less than ½ an ounce of cheese per sandwich. Obviously in a family style meal like this, that will vary. But if you have a scale available to you, I’d recommend measuring out the meat and cheese, then loading on additional peppers. Rowenna and I pulling the beef roast apart over the fire.